Organizations that have HTML files configured for the Header / Footer areas in "legacy" Customer / Partner Portals may find that that these areas fail to completely display content or render CSS style tags as escaped text on the page. Users without at least "Read" access on Lead entity not able to send emails in Case Feed email publisher. When using the Enhanced Profile User Interface in Summer '16, the option for "Tab Hidden" cannot be selected. 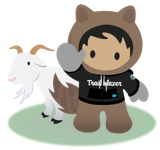 When an @InvocableMethod containing a parameter of Integer data type is being added as an Immediate Action in Process Builder, an Internal Salesforce.com Error is thrown containing an error ID. This is only happening in Summer 16 Orgs. In Summer '16 Orgs, once an Account Team Member is added, their access rights cannot be modified. As an example, if you add an Account Team Member with Private Access to Opportunities, you cannot go back to edit that access to Read Only - the change will not stick. If a delete operation fails for an Opportunity Stage Picklist value and you attempt to add this value back into the field a duplicate value error will occur.